Today (Feb. 2) I am exactly one year post op from my valve repairs performed by Dr. Adams and the Mt. Sinai team. 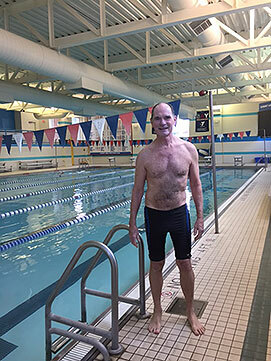 Wanted to send you a photo taken about a half hour ago, when I finished my weekly one mile swim. I'm also back to running (with a half marathon scheduled in the Spring), and biking (2 bike trips this past summer, each over 100 miles). Thanks to Dr. Adams and everyone at Mt. Sinai! P.S. Since that photo, I'm up to 8 miles in my training runs, (and also placed 6th in my age group in a 5K down in Florida), so I should be fine to do a half by April. In June, I'll be doing the Lavallette sprint triathlon in Lavallette, NJ. I'm also back working as a volunteer EMT in my home town of Summit NJ. I've been doing this wonderful volunteer work (driving the ambulance and treating patients) for almost 14 years, and I was able to return to full duty less than 4 months after my surgery. That surgical team is so good that I barely have a scar to show!